It’s likely there is a better photo of Jan on Ray and Diane’s blog. 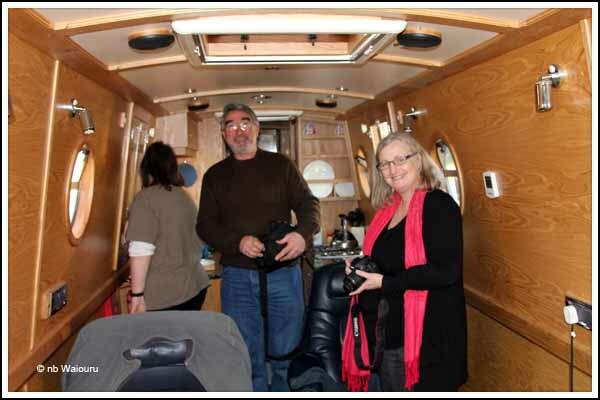 It was interesting to hear Ray and Diane discuss their 2013 cruising plans along with wintering over in a marina. Of course we also had to discuss toilets. Once we start cruising we will hopefully meet again. All too soon Ray & Diane were on their way to their hotel! First thing this morning I went down to the boatyard and filled two 20 litre containers with red diesel. This was brought back to Waiouru using a sack trolley. The diesel was then syphoned into the Hurricane heater tank using the recently purchased syphon system. Unfortunately the syphon is incredibly slow. The problem is the internal diameter of the plastic tube is so small it seriously restricts the rate of flow. How it did transfer all the diesel from the containers to the fuel tank. After mentioning the problem to Ray he showed me a battery powered syphon pump they recently purchased from eBay. It looks a much better choice so Jan ordered one late this afternoon. The fine weather has resulted in boats starting to move. It was immediately apparent the edge of the bank is very soft and our mooring pins were starting to loosen. I decided to try out two of the four anchor plates I made from some scrap steel. 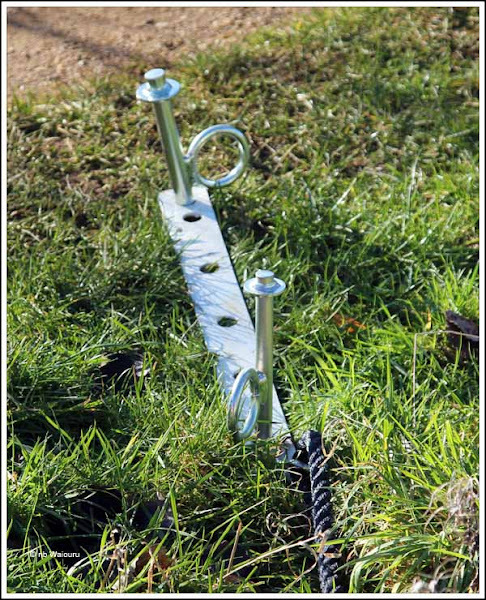 Initial indications are this is a much stronger ground anchor. Then some time was spent on the three fold gangplank. The ends were reversed and I found a short length of 4x2 timber dunnage to place under the boat end. The idea is this will protect the paintwork. 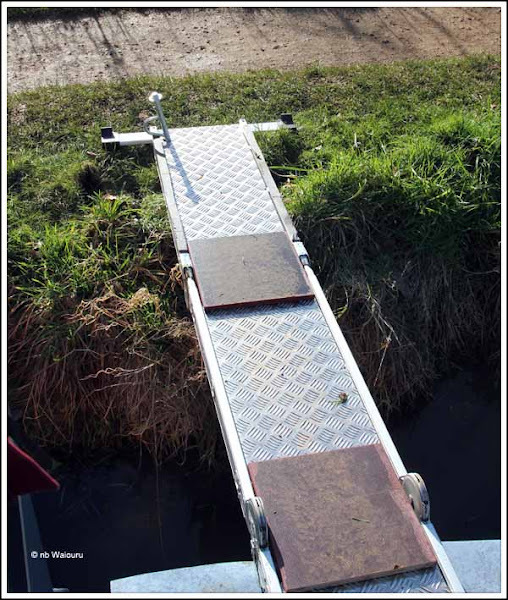 We have been discussing buying a few more pieces of Dri-Dek interlocking matting for the roof of the boat. The ladder would sit on it when in storage thereby minimizing the likelihood if the aluminium ladder frame scratching the paintwork or causing micro blisters. Last task for the day was to rearrange everything in the bow thruster locker to make room of the pump-out kit. No doubt the next thing required out of the locker will be at the bottom! I'm either going the require a camera with a very fast shutter speed or a set of chains!